Then, she was lucky enough to go to Comic Con, which I have always wanted to do … not just for the comics, but for the clothes. I mean costumes. Whatever. You should totally go check out Kristen's blog) to see the side and back views and the awesome red shoes she chose to go with the dress, too. 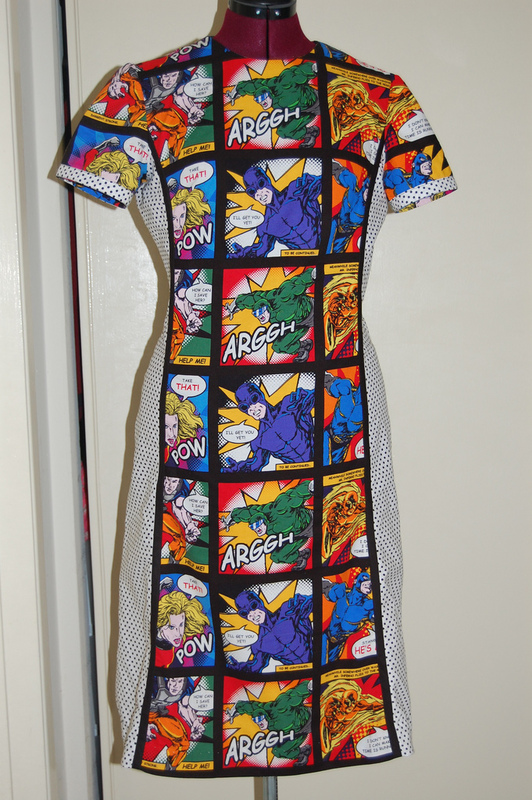 i am not sure how i missed that you are a comic fan… secret super hero life of a dress?pretty please? That is incredibly cool, I’d love a circle skirt made out of that fabric. Um…you do know that Comic Con is way far away from Vancouver, right? Like, at the far edge of the neighboring country? This is a great dress – would it qualify as a stunt dress? Too bad I’m not, you know, an iTunes person or I would be all over Dr. Horrible’s sing-along blog. oh and labelladonna, me too. In costumes my friends asked me to never wear again. La Bella Donna – raccoons?! Do tell. Heck, I would go to Comic Con just to have run into Hugh Jackman! Meow, Wolverine! God that’s gorgeous…I don’t honestly know if there are things like ComicCons in the UK, so whether I could go to one is in doubt. We do have computer fairs though, which is great to buy cheap circuitboards, etc., to include in stuff. I also own some blue-on-white spiderman print material I haven’t done anything with yet, I’m thinking a pencil skirt, but no chance could it look as great as this dress. Drag queens do NOT wear dresses that have comics on them. I don’t know why, but it’s a rule. cookie – be the exception to prove the rule? Hmmmmmmmmm…maybe a nice Wonder Woman print with a lot of vibrant, royal blue in it?